KEY FEATURES: Shrub with long ascending branches with large opposite leaves (to 30x12cm) with dramatic terminal clusters of bright red flowers. 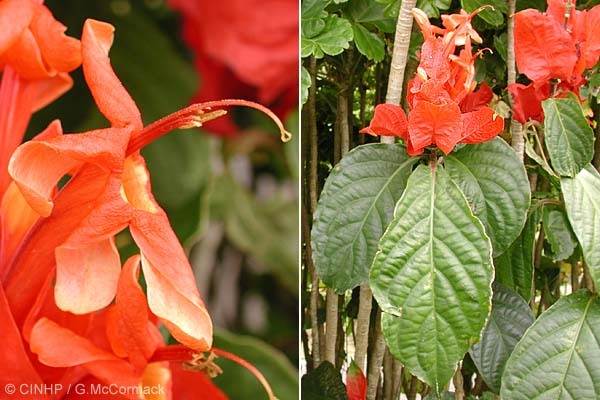 The large leaf-like bracts are red; the red corolla tube is curved with a yellow throat, ending with 5 oblong petals. Native of Brazil. An occasional ornamental. SIMILAR SPECIES: Often recorded mistakenly as Ruellia colorata, which is a synonym of Hemigraphis alternata, an very different plant. The present species is rather similar to Ruellia elegans (not presently recorded in the Cook Islands). IDENTIFICATION: Shrub with long upward tending branches to 2m. STEM with scattered small spines. LEAVES opposite, dark green above, light below; oval, to 30x12cm, puckered into ridges between large veins; stalk to 2cm. FLOWERS terminal cluster, bright red leaf-like bracts to 8x5cm, tip sharp; corolla curved tube to 6cm, red with yellow interior, with 5 oblong lobes to 2cm, the upper two fused about 25%; stamens and style protruding about 2cm.